Playing in the Sand: Why Sandbox Games Are So Much Fun? Rate this Article With the rise to popularity of games like Minecraft and Terraria, sandbox games have regained the attention of modern day gamers. What makes these games so fun to play? Let's find out! Today, one is much older or much way too old to play around on the sand let alone fit into a sandbox, but the delights of being a fictional world builder once again is made possible by a computer and a sandbox game. To be able to build and create one’s own digital world complete with objects, terrain and events tailor made to one’s own liking. This kind of video games also known as Sandbox or open ended games have become very popular to the younger generation and those who would like to re-live their sandbox playing days. Sandbox games differ from the usual procedural or sequenced game play where the player needs to perform certain tasks in order to advance through the game. The sandbox game style does away with all of those requirements and lets you play according to your mood and what you prefer to do. It lets you build your own world and set your own rules and game objectives. However, open-ended sandbox gaming should not be confused with open-world games which are mostly MMORPG games that give you the freedom to achieve a main goal at a non-linear pace and by achieving your selected (optional) minor goals first in order to get to the main one. Open world games really function like sandbox games in a away but the differences become apparent as you play them. Examples of these games would be both Rift an MMORPG with the likes of World of Warcraft and The World of Ryzom. Sandbox games are more like world builders and a good place to start if you want to learn how to make computer games. But then, even with the freedom to create and roam around, there are still in-game limitations that have to be taken into account. These may have to do with the games overall design or the limitations of the computer hardware used. One positive outcome of Sandbox gaming though has been the creation of on-line gaming communities brought about by these games. An example would be the game Roblox which was released way back 2004 and grew to a massive amount of around 6 million users worldwide. The game started as a world building- social media cube oriented game much like Minecraft. However, Roblox evolved through the years by improving itself based on the constant feedback of its gaming community. Members where encouraged to submit and display their own characters and world creations and to engage in micro-transactions like purchasing in-game items and selling or bartering their own creative accomplishments. There was even a way for members to earn a lot of in-game cash and exchange them for real money by subscribing to premiere and special subscriptions. 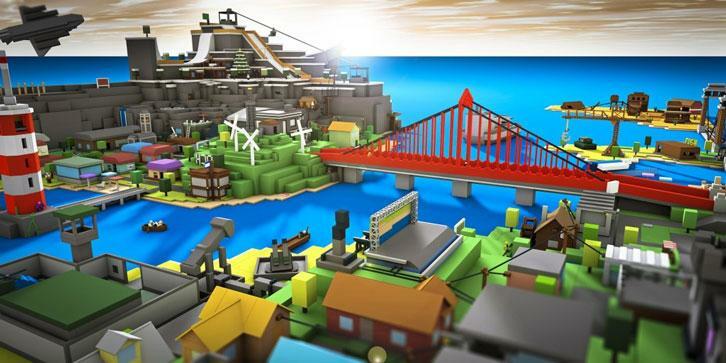 Players created their world using a game editor called Roblox Studio. Events and instances that occurred based on a reaction to the inputs of a player could be programmed or scripted using LUA 5.1 programming. The community even had security protocols for much younger gamers like 13-year-olds which blocked certain inappropriate language and in-game features from them. The community had established a way to moderate the game and keep it as safe as possible and appropriate for all ages while maintaining the Fun factor of the game play. Roblox as a social game let players communicate with one another, build worlds, invite friends and groups, trade items, discuss creative development issues and simply play around and goof with each other. Social responsibility was also a part of the game as certain in-game items like hats and clothing where sold to raise money which was donated to the Red Cross to help victims of terrible calamities worldwide. An example was the 2011 earthquake-tsunami that hit Tohoku, Japan. Other sandbox games worth mentioning would be Kogama which is very similar to Roblox in game and community. The Kogama community is more like a compilation of different sandbox created games, some really good, some not so bad and some you’ll wish you’ve never had. And if you like adventure games and those that make you go a questing while building worlds of your own that can be accessed through portals, Trove is the game for you. Although somewhat looking like a Minecraft clone, the game has almost all the elements of an MMORPG game like character creation, group and party building as well as item crafting and a storyline. You can even build a house or base of your own which you can uproot and take with you to another game world and transfer it there with your inventory intact. Sandbox games have always been something of a creative outlet for gamers and it will continue to be for generations to come. Although it’s no actual sandbox, these games offer so much functionalities in the digital space, allowing you to create literally anything you fancy. This is why sandbox games are so addictively fun.